There are many thermometer projects on the web and shops sell them at low prices, so why build another one? The DS1620 can measure temperature over the range of -55 C to +125 C with 0.5 C resolution. However, if we want to use the DS1620 stand-alone we first need a way to program the device and set TH and TL to the temperature we want. This is the reason for this little project. In addition it displays the temperature on 3 digit 7-segment display. It has a serial interface which allows programming of the DS1620 and we can also record and plot the temperature on a PC. The temperature reading is send automatically every second or on request. The program is written in assembler and compiled with gavrasm. Note that temperature is represented in the DS1620 in terms of a ½ C LSB, resulting in a 9–bit format. Command 'r' returns TH / TL as hex temperature * 2 because of the 9–bit format. H=001E hex is 30 decimal meaning 15 degrees is set. It' not a bug, it's a feature. When you send H15 the program will multiply 15 * 2 and program the DS1620 with 15 degrees for TH. Living in a warm country I have not implemented programming of temperatures below zero, L00 is the lowest temperature which can be programmed. Feel free to change this. The 't' command returns the temperature in degrees Celsius, T+02863 means +28.63 C. Temperatures below zero are shown on the display like temperatures above zero, in addition PD6 goes to a low level and could be used to turn on a blue led. The 't' command would reply with e.g. T-01726 on RS232. Noname 3-digit common anode displays are used here. You may find similar ones but with other displays the program will need some adjustment for the different pin assignment of the display. Easy to do but that's why the circuit digram below is a bit sketchy regarding the display. No Quartz is used so the XTAL1/2 are normal output to the display digits, dig1 = PA1, dig2 = PA0, dig3 = PD2. The 220 Ohm resistors are wired from PORTB to the nearest pin of the display, which results in segments B G C dp D E F A to PORT 7-0. In the program is a translation table to handle this situation, you should adjust this for your display. There is no need to install the display if you want to program the DS1620 only. If you want to show the temperature only the RS232 parts can be omitted. Circuit diagram of the thermometer. 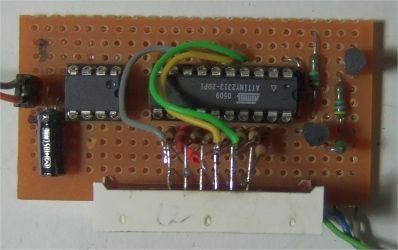 The RS232 interface is using just 2 transistors instead of the usual MAX232 to save parts costs and space on the board. Here the collector of Q2 is connected to pin 4 of the plug which means your terminal program has to turn on DTR -Data Terminal Ready- in order to receive data. It depends on the PC's serial interface, in some cases it may be enough to connect R4 to GND but you have to try first and check if the PC can receive data. This is why auto send is on by default. Baudrate is 9600,8,N,1. If you can't send or receive any data or get garbage the clock frequency might be too far away. The program uses the 4 MHz internal oscillator ( unprogram CKDIV8 fuse and write CKSEL3..0 to 0011 ) and the baudrate is derived from the clock. Check the signal on one of the digit pins, e.g. PD2, it should be close to 2ms high on a scope. Otherwise change the OSCCAL register in the reset routine, a bit of trial and error, until the internal oscillator is calibrated. PD6 is used in to indicate temperatures below zero. PD6 goes low below zero degrees and high above. It will also send the temperature as T+02863 or T-01726 (in my freezer). Below is a proposal to show if it is below zero or above, below the blue led is on, above the white. 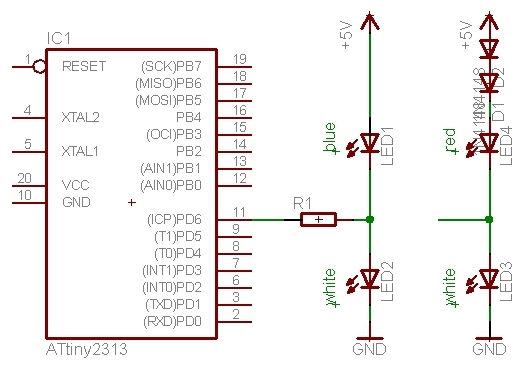 It' a trick to use 2 leds on 1 I/O pin and I have used it before on devices with few I/O pins. It can show 3 states: blue, white, and both off if you make the pin an input in the data direction register, not done here. Looks a bit like charlieplexing leds. Here you see how it could be built on a simple perf board. No leds used here. Top view of the thermometer, on the left is DS1620 on a socket and it can be removed once it is programmed. Bottom view, shows the wiring, upper right is the RS232 connection to the PC. 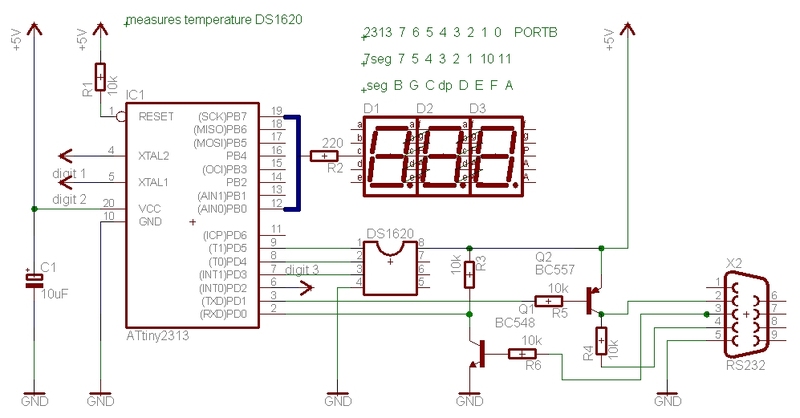 Once the DS1620 is programmed it can be used in continuous mode as a simple thermostat, no microcontroller is required. Don't forget to write Config to default settings CPU=0, 1SHOT=0 (command d) before using it stand-alone. It can control a heater for your yoghurt maker or the cooling fan in a PC which is turned on when the temperature is above TH. 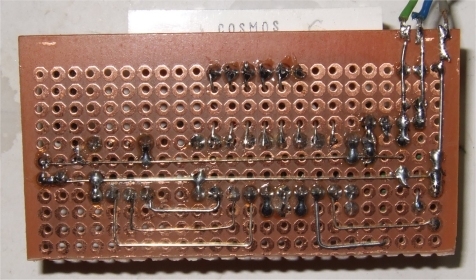 It's recommended to read the DS1620 datasheet to get some ideas. Otherwise it's just nice to have a thermometer which you can see in the dark. .def IntrSREG      = r2              ; Statusreg. ldi	temp0,'?' ; something else, send ? dec Temp0                       ; Noch weitere Bits? dec Temp0                       ; Weitere Bits? ;   Initialisiert den DS1620 f�r den "One Shot"-Betrieb. rcall DS1620ReadCfg             ; "Read Config"
andi Arg0, 0b00001111           ; CPU=1 und 1SHOT=1 ? ldi Arg0,  0b00000011           ; "Write Config"
DS1620Setup1:   rcall DS1620ReadCfg             ; Fertig (NVB=0)? andi Arg0, 0b00001111           ; CPU=0 und 1SHOT=0 ? ldi Arg0,  0b00000000           ; "Write Config"
DS1620Def1:	rcall DS1620ReadCfg             ; Fertig (NVB=0)? ldi Temp1, 0xac                 ; "Read Config"
ldi Temp1, 0x0c                 ; "Write Config"
;   DS1620Start: Startet die Konvertierung. ;   DS1620Stop: Beendet die Konvertierung. ldi Temp1, 0xee                 ; "Start Convert"
ldi Temp1, 0x22                 ; "Stop Convert"
;   Liest das Ergebnis der letzten Temperaturkonvertierung. ldi Temp1, 0xaa                 ; "Read Temperature"
;   Liest das Counter/Slope Register. ldi Temp1, 0xa0                 ; "Read Counter"
ldi Temp1, 0xa9                 ; "Read Slope"
;   Setzt das TH/TL Register. ldi Temp1, 0x01                 ; "Write TH"
ldi Temp1, 0x02                 ; "Write TL"
;   Liest das TH/TL Register. ldi Temp1, 0xa1                 ; "Read TH"
ldi Temp1, 0xa2                 ; "Read TL"
;   Zwei 16-Bit Zahlen (mit oder ohne Vorzeichen) multiplizieren. ;   Div16: Zwei 16-Bit Zahlen mit Vorzeichen dividieren. ;   UDiv16S/M: Zwei 16-Bit Zahlen ohne Vorzeichen dividieren. ;              Eine von beiden in UDiv16 umbenennen. Div16_50:       TST     Temp            ; result should be negative ?